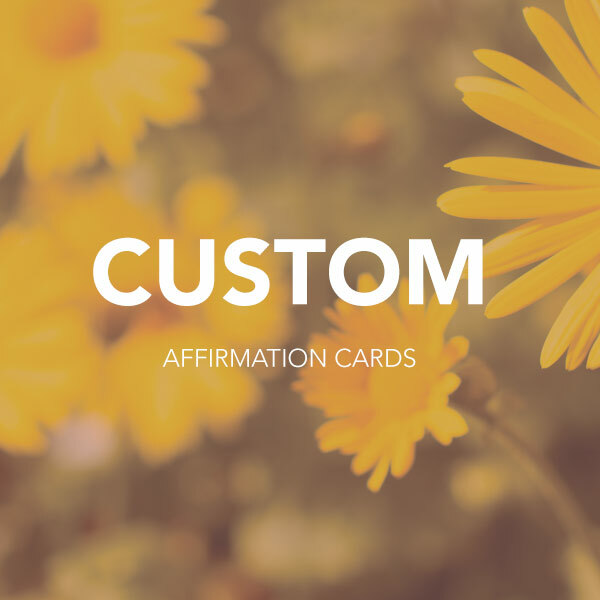 Custom affirmation card sets geared towards themes you provide. PLEASE NOTE THESE CARDS ARE HANDMADE TO ORDER. PLEASE ALLOW 1-2 WEEKS FOR PRODUCTION. CUSTOM AFFIRMATION CARDS ARE FOR PERSONAL USE ONLY. Custom Affirmation Cards are available in a set of 25. Please include your desired theme(s) (ie. I’m going through a breakup, I have no confidence at work, etc.) and colors in the order notes during checkout and I will come up with a custom set of affirmations/quotes for you. These also make great gifts for friends/family who may be going through a hard time or just need extra motivation. Affirmation Cards can add inspiration to anyone’s daily meditation, journaling or relaxation practices. Read the card aloud and think about each word. Visualize the words. Reflect on what you are reading and think about each affirmation as an action, not a thought. Repeat The Affirmation(s) 3-5 times. If needed, carry the card with you or place it in a place that is highly visible.